Wordwheel puzzles are a fun and simple word puzzle that are a fantastic test of your anagram solving skills, and indeed your vocabulary! In our wordwheel puzzles, we've selected a range of words that can be made from the letters given in the wordwheel. All you have to do is see if you can find each of the answers. We have listed answers by length and then by alphabetical order, to help you work out where the gaps are and which words you are still to find. Please note that you will need to ensure that every word you make contains the central letter. As working out which words in a dictionary count as too obscure or not is very much a matter of subjective opinion, and some words are basically unknown, we have not selected an exhaustive list of words by any means for each puzzle. Therefore there may be words that you find that we haven't selected - the aim is to try to find the words that we have selected for each puzzle. 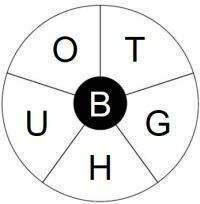 In order to keep the total number of words down to a manageable level, the majority of wordwheel puzzles we display on this site are composed of 6 letters, and we ask you to pick 3, 4, 5 and 6 letter words. Typically you will not be expected to find plurals and certainly proper nouns will not be counted, by which we mean words that start with a capital letter such as London or David. Can you find all the words in each puzzle? It can be surprisingly tricky to do so, but we hope you have fun trying along the way!